LG A120 Basic Non Camera Phone With GPRS & FM Radio. ~ All 4G Non Camera Smartphone Mobile Phones Without Camera Phone. LG A120 Basic Non Camera Phone With GPRS & FM Radio. 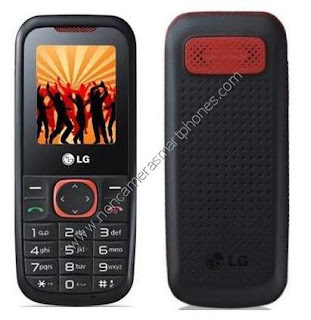 LG A120 is a basic non camera GPRS phone with built-in games and FM Radio with scheduled recording feature for fun and entertainment. The camera-less phone weighs only 72.5 grams and is 108 x 45 x 12 mm in dimension. 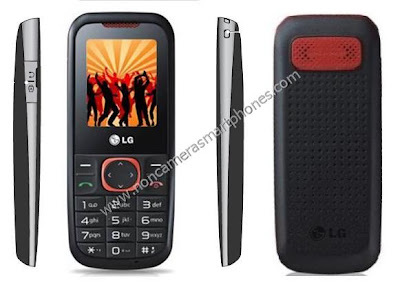 The without camera LG phone has GPRS WAP facility for internet surfing. The cell phone has built-in 1 MB memory storage but lacks external memory card slot. The camera less phone uses a standard Li-Ion 950 mAh Battery which provides talk time of 13 hours and standby time of 1300 hours.The mobile phone comes only in black color. The LG A120 non camera phone does not support USB connectivity for mobile battery charging or data transfer to PC or laptop from mobile. The phone does not support bluetooth, infrared, GPS, Java, Wlan Wi-Fi and EDGE facility features. The phone supports phone book, call records, loudspeaker and hone recorder. Explore LG A120 Non Camera Phone with GPRS Internet & FM Radio facility Features, Specifications, Images, Photos, Comments, Review & Price in India. The phone operates at a 2G network at a frequency of GSM 900 / 1800. The Phone uses a 65K TFT display with 128 x 160 pixels resolution and the screen size diagonally is 1.77 inches. The phone supports SMS , mp3 ringtones and vibration for silent mode. The phone has a built-in WAP browser for internet surfing. The standard 3.5 mm audio jack is also missing in the phone but it uses stereo speakers for better audio sound quality for music lovers. The accessories include handset, battery, charger, hands free and user manual. Also check LG A270 Non Camera Phone with GPRS Internet Features, Specifications, Images, Photos, Comments, Review & Price in India. Features and Specifications of LG A120. The price of LG A120 Non Camera Phone with GPRS Internet and FM Radio Mobile in India is Rs.1350 /- only.